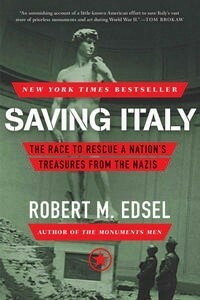 Saving Italy, The Race To Save A Nation’s Treasures From The Nazis, is Edsel’s follow up to the critically acclaimed Monuments Men, which recently became a major motion picture starring George Clooney. As a result of this I expect this book to get more attention, which is great because it truly deserves it, for both the book itself and the families of the Monuments Men. The book again stars the Monuments Men, a group of academics, sculptors and artists who enlisted in the army to save the artistic heritage of Europe, and in particular for this book, Italy. The book follows several of the Monuments Men’s journeys through Italy, in particular the journeys of Deane Keller and Fred Hart, two contrasting individuals who disagreed regularly but pulled together for the cause. On top of the journey of the monuments men, the book documents the extensive looting operation of the Nazi’s. In particular it follows Karl Wolff, the leader of SS troops in Italy. These moments also include more general war information and history about the Nazi’s occupation of fascist Italy. This ongoing narrative is splendidly put together by Edsel who manages to weave the stories of several individuals together into a coherent, somewhat sequential collection of events . What really makes this book shine, is the sheer wealth of research that Edsel and others have put into it. This is all that is needed to allow this staggering true story to shine. The story includes genuinely draw dropping factual moments , moments that see some of the greatest cultural treasures in the world at risk. The sheer rate of Nazi looting takes a lot to be believed, but throughout, Edsel recounts the events as they’ve been reported, rather than dealing with the Nazi’s in a hyperbolic way. This is a positive way of dealing with the issue as it makes the book appear more reliable. Their are touching moments to this book. these come in the form of letters that the men and wives exchanged. They give a sense of humanity to proceedings. The emotional attachment to the soldiers is not something I expected when picking up the book, it serves to add another dimension to the intrigue. It’s important to add that their is no need to read the previous books to enjoy this one, if you haven’t it will probably result in you reading the previous episodes, as this novel is unlike anything I have ever read, it brings together art, culture, war and humanity in a way that remains refreshing even after reading the previous instalments. It poses the unanswerable question of how valuable art is and what lengths humans should go to protect our cultural heritage. A negative point about this book is that if you aren’t aware of what the cultural objects are, it’s hard to imagine the scenes in the book. As a complete amateur in artistic history, I had no idea who some of the artists in question were and therefore how priceless their works of art are. I can see that this could take away some of the meaning of the book, due to blind ignorance. However I liked to see every piece of art that was being mentioned so that I could imagine what it meant to the Monuments Men when they saw these sacred items. I did this simply by Googling the works of art just to get a feel for them. Also some parts of the book slow the pace considerably, most notably when talking about the more military history of the war in Italy. I sometimes found these to be of unnecessarily dense detail, which distracted me from the trials and tribulations of the Monuments Men. However these military moments are thankfully short-lived and the action resumes within a couple of pages. Overall I would give this book an 8.5 out of 10. Due to the book being of a unique nature. This is not just another war novel! It’s an exciting, narrative driven account of an almost unbelievable historical event.